March has been filled with many varied and exciting events. I hope you enjoy reading what I have been doing. March at the Campsie Writers’ Group was very exciting. The result of the 500 words competition was announced and I ran a workshop. Several of us had written a short story of up to 500 words and Bella from East Dunbartonshire Voluntary Action (EDVA) had judged who she thought had written the best story. Everyone was very keen to find out who had won. The winner was one of our newest members, who was very surprised to have won. I ran a workshop based on an upside down biscuit tray. I asked the group to write down what they thought when they looked at the biscuit tray. There were lots of very different ideas. Next I asked them to write about a character in their story idea or to describe the environment where their story was set. Everyone had written something different. I loved running this workshop. In March I went to the Scottish Association of Writers (SAW) 50th Conference for the very first time. I was a little nervous going on my own knowing only one person there, the President of SAW Wendy H Jones. I had a great time. Everyone was very friendly and welcoming and the three workshops I attended were extremely interesting. I entered ‘I Can Create Stories’ into the self-published book competition and was very pleased with the comments of the judge. Philip Paris won the self-published book competition. I am definitely going to another conference. I spent an excellent afternoon at an Indie Authors meeting at Waterstones, Sauchiehall Street. I really enjoyed meeting everyone and catching up with what they had been doing. The first speakers were Kim Macleod and her daughter Kirsten who were launching Calum's Legacy. A project is aimed at 16 - 25 year olds in the East Dunbarton and Greater Glasgow areas. The young people will be creating pieces of writing and then learning all the steps it takes to publish a book. An actual book will be published at the completion of the project. Here is the link of you know of anyone who may be interested in finding out more - https://www.indieauthorsworld.com/calums…/calums-legacy-faq/. The second speaker was Shirley Whiteside from Pulse Radio, where she has a radio show called 'Booked', she interviews authors. She gave some excellent tips for an author who is going to be interviewed. I was very interested to hear what she had to say. 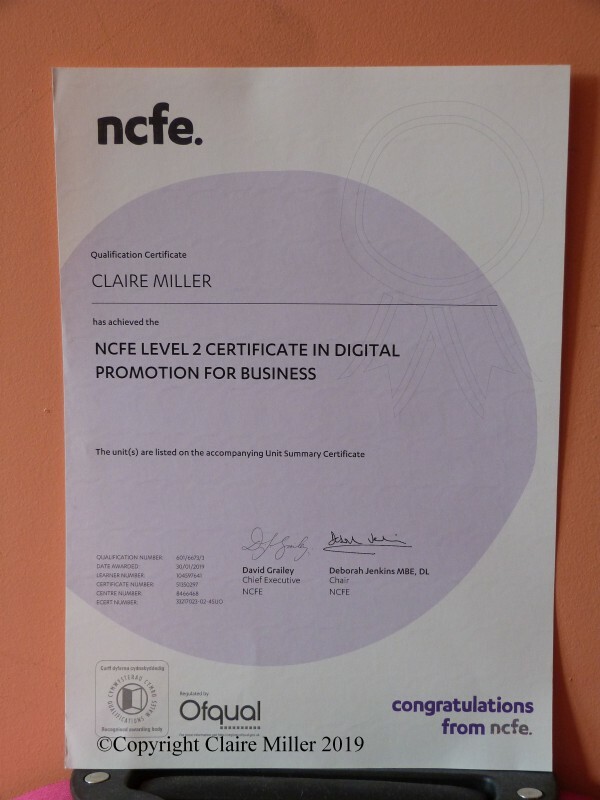 I was very excited to receive my NCFE Level 2 Certificate in Digital Promotion for Business. This was the certificate for a 2 month online course which was all about social media and promotion. I learned about all the different elements of social media and promotion techniques. I found this course very interesting and learned a lot. How did March go for you?